With this post, I’m not trying to evaluate the merits of having open walls versus more strict regulation of murals. I’m just hoping to debunk the perception that open walls are becoming the new normal by questioning the state of open walls in a few places that are (for the most part) considered to have thriving muralism scenes. Let’s begin in Barcelona, home of the Open Walls Conference. There are some great murals, but even a major article celebrating the festival notes how less-than-open the walls of the city really are if you don’t know the right people or paint in exactly the right neighborhood. From what I’ve heard, the practice of fining property owners for commissioned murals is much more common than what Open Walls Barcelona was able to pull off. 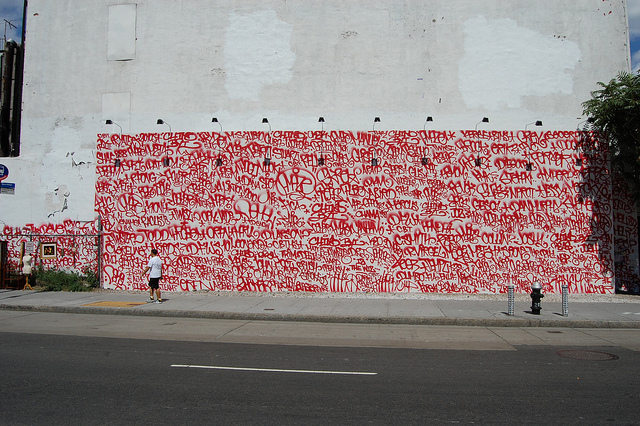 Interestingly, the Open Walls Conference organizers also run OpenWalls, a “network of legal walls to paint,” where artists can download permission slips to paint certain walls legally. So far, there’s only four walls in the network, but it’s a great idea to get around certain regulations and provide legal walls for any interested artist. Kudos to the conference organizers for making it work at the conference and for developing the OpenWalls network, but let’s not pretend that Barcelona is a land of open walls. 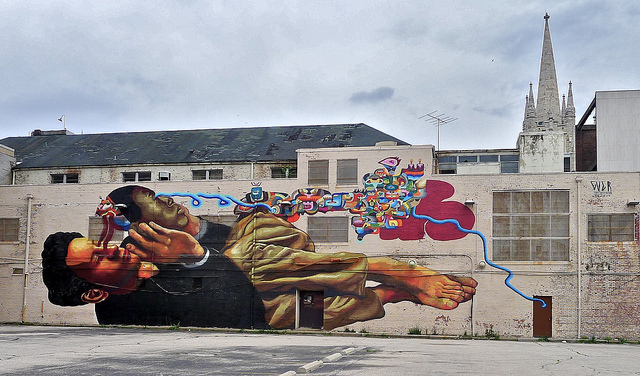 Hyuro’s mural in Atlanta, before it was buffed. Photo by RJ Rushmore. In Atlanta, City Hall and public art organizations are in the midst of struggling to figure out a set of enforceable and constitutional mural regulations. For years, organizations and individuals in the city have fluctuated between trying to obey a confusing set of existing public art regulations and ignoring the regulations entirely, all while trying to craft a new set of pro-art regulations. Creative Loafing, a local alt-weekly, has done a great job covering the latest developments in this ongoing saga here and here. In short, the proposed and nearly-approved legislation before the City Council would have “required commercial property owners to seek city approval before painting murals on exterior walls” and had language which was “vague concerning the definition of a mural,” according to Creative Loafing. Even with a world-class mural festival in their city, Atlanta’s walls are not actually so open, and more restrictions may be coming. 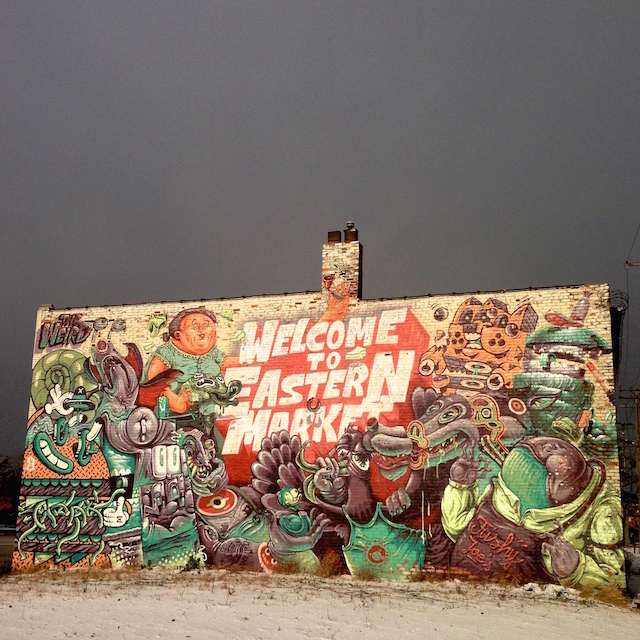 A mural in Detroit by The Weird (to my knowledge, the property owners have not been ticketed for this mural). Photo by RJ Rushmore. If graffiti has a Wild West, it’s Detroit, so it may come as a surprise to learn that Detroit has aggressive laws when it comes to combating graffiti: If a building owner is issued a ticket for graffiti on their property, they have to clean it up or face a fine. Recently, Detroit’s mayor decided to utilize that law to crackdown on graffiti, ramping up enforcement and ticketing building owners en masse. This, of course, raises the question of whether forcing building owners to clean graffiti off of crumbling buildings is an effective use of the city’s resources, but that’s another matter… In addition to (presumably) ticketing property owners for graffiti that had been painted without anyone’s permission, the city also issued thousands of dollars in tickets to property owners for commissioned murals. Luckily, in the end, the mayor apologized and the businesses will not have to pay the tickets. Still, a scary moment for property owners. Hopefully, it doesn’t put a damper on the open walls vibe that exists in Detroit today, with many amazing murals (and pieces of graffiti) going up around the city. More on this story at Hyperallergic. 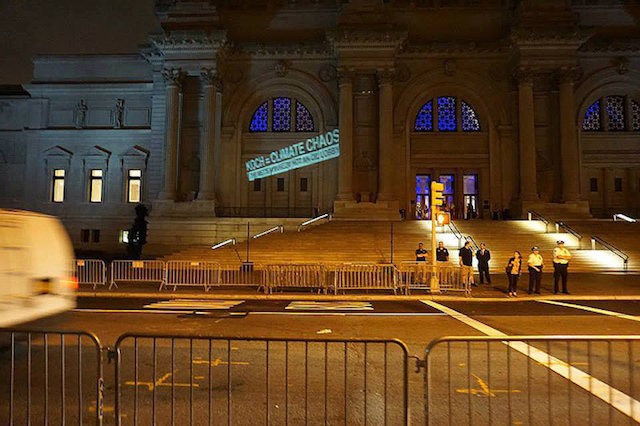 An Occupy Museums protest action which results in three arrests for “unlawfully posting advertisements.” Photo courtesy of Occupy Museums. As I mentioned on the site back in October, a great article on Hyperallergic shows how New York City appears to let corporations get away with blatantly illegal public advertising while going after artists and activists for similar (or in some cases less physically “destructive”) work, punishing creativity and obliterating any notion of “open walls”. Additionally, while New York City does have some strong mural programs, street artists worry about gentrifying themselves out of their own neighborhood when they paint. 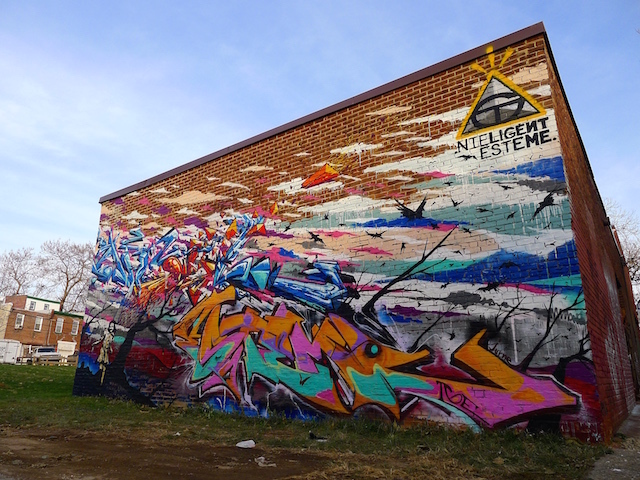 This piece in Philadelphia by Ntel and Esteme was painted with the property owner’s permission but not organized by the Mural Arts Program. Photo by RJ Rushmore. Philadelphia is the mural capital of the world, thanks largely to the City of Philadelphia Mural Arts Program (where I work). It does not, however, appear to be a land of open walls. The city’s Anti Graffiti Network has buffed at least one legal wall against the wishes of the property owner and the artists, and in this article/chat Conrad Benner of StreetsDept was unsuccessful in getting a solid answer out of the head of the Anti Graffiti Network as to what the Anti Graffiti Network would or would not buff. The status of open walls in Philly remains uncertain, but highly unlikely. Advertisement for Miller Fortune in LA by Risk. Photo by Hrag Vartanian. 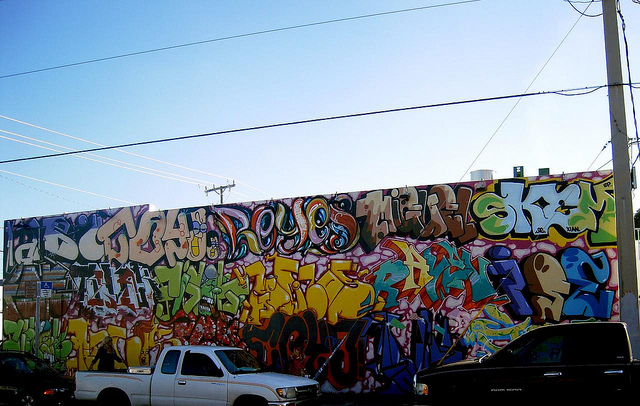 In Los Angeles, murals were illegal for years (although this was only selectively enforced) as the unintended consequence of an attempt to regulate outdoor advertising. After new regulations were put in place that would allow for the first legal murals in over a decade, artists and mural organizers promptly began thumbing their noses at the city, or just not following the permitting process properly. As a result, murals are being buffed. In this case, I don’t entirely blame the city. Yes, they’ve got a myriad of regulations and a complicated permitting process, but it doesn’t help with mural organizers decide to just ignore all the regulations and paint advertisements masquerading as murals, the very thing that city officials feared would happen if they once again allowed murals to be painted legally. Murals are practically illegal in Palm Springs, but this sculpture is fine. Photo by Fred Miller. There’s a similar situation in Palm Springs, California. First, a mural project “was shut down by Palm Springs police after city officials claimed the project was illegal—even though the city Public Arts Commission had endorsed the project,” so the City Council implemented new regulations regarding murals, but the application process is complicated and expensive. 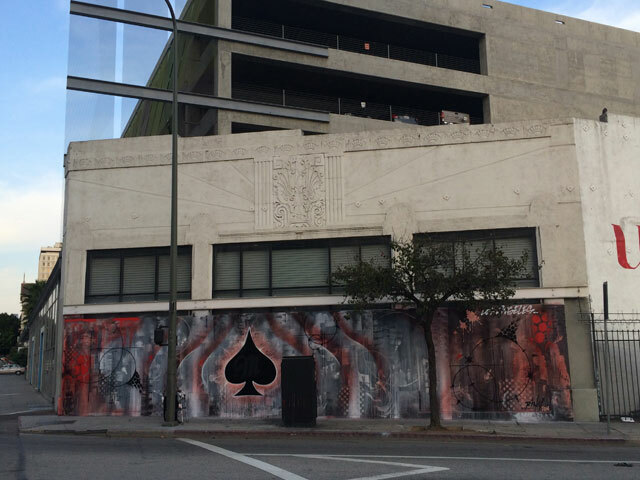 So far, six months after the regulations were put in place, no new murals have been approved. No open walls in Palm Springs. A mural in Wynwood, Miami. Photo by Rob Larsen. The Miami neighborhood of Wynwood is known as a public art mecca, thanks at least in part to property developers who have celebrated graffiti, street art, and muralism in the neighborhood and used it as a catalyst for development. I’ll admit to not knowing what it’s like 51 weeks of the year, but that one week of the year that the art world descends on Miami for Art Basel Miami Beach and its satellite fairs, Wynwood is an artist playground. It’s hard to walk half a block without seeing someone painting a mural or tagging a wall. There is no doubt that all forms of public art, even illegal graffiti, have contributed and continue to contribute to the growth of the neighborhood and other areas of Miami. And yet, police in Miami have occasionally gone after graffiti writers with such aggression that Israel Hernandez aka Reefa and Delbert Rodriguez Gutierrez aka DEMZ were killed by the police pursuing them. In the case of DEMZ, he was catching a tag in Wynwood during Art Basel Miami Beach. Given the effect of graffiti on that neighborhood, he might as well have been painting a commissioned mural. The Miami police force is going after and physically attacking the people who make the art that property developers (and by extension the city, through tax revenue) make millions from. A Banksy piece painted without permission in the UK. When the piece was removed from the street to be sold, its loss was mourned in Parliament. Photo by Andy Maguire. While the situation in Miami is tragic, the status of walls in the UK is probably the most absurd. In the past few years numerous people have been sentenced to significant prison time for graffiti in the UK, and local government officials are trying to remove a mural by Fin Dac in the posh London neighborhood of Maida Vale by claiming it is an advertisement. 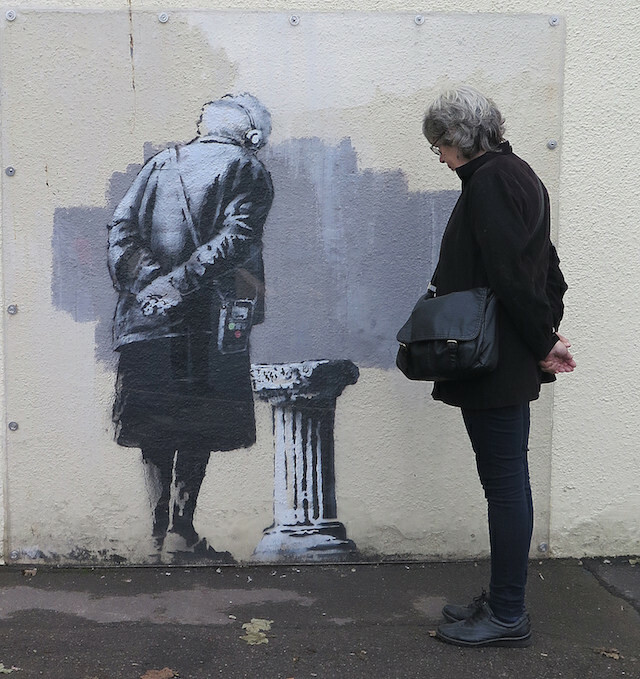 On the flip side, local government officials in another London neighborhood and a conservative Member of Parliament have publicly urged for illegal works by Banksy to be returned to public view after the works were removed from walls and prepared for sale. But the UK’s policies are best exemplified by the case of Tox. When Tox was being tried for graffiti in 2011, the prosecution made Tox’s case at least in part about artistic merit (or lack thereof), implying that because Tox “is no Banksy,” he should be found guilty and go to prison. That message struck a chord with the judge, who sentenced Tox to prison for 27 months and said to him, “There is nothing artistic about what you do.” Shortly before the sentencing, Banksy himself weighed in on Tox’s case and the double-standard that exists when graffiti writers are sent to prison while street artists run free. 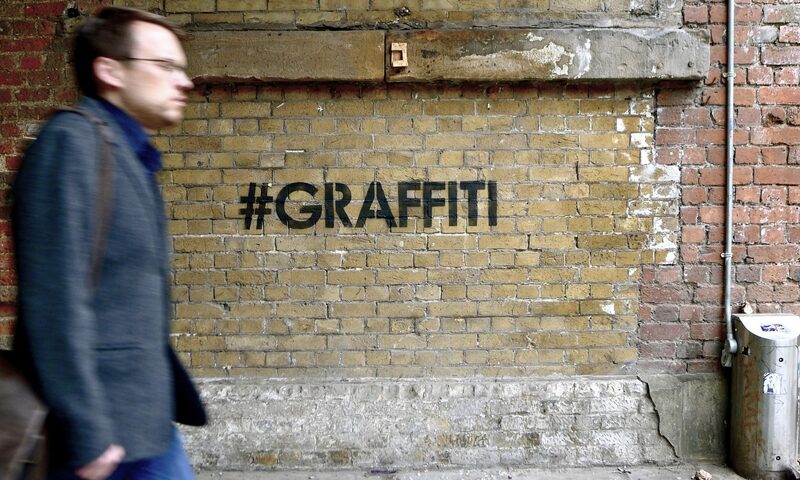 So, in the UK, the walls are open, but only if you’re Banksy. Ever’s mural at Open Walls Baltimore. Photo by RJ Rushmore. Baltimore is a funny case. Gaia, the organizer behind the Open Walls Baltimore festival (which is not affiliated with the conference in Barcelona), notes that “Ironically, because of its curatorial nature, because I was pulling from a network of highly trained street artists, the process for picking artists was decidedly exclusive.” Still, if Nether’s recent guest post on Vandalog is anything to go by, Baltimore may be the closest out of any of the cities highlighted here to having something approaching open walls. So that’s a little round up of a few places that, like most major cities, don’t quite have open walls. Maybe we should have open walls. Maybe not. That’s a debate worth having, but it can’t be had until we understand where we’re at now and what the other options are. It’s easy to get suckered into believing that it’s global free-for-all for murals, and people inside and outside of the street art world seem to be making that mistake, but reports of open walls have been greatly exaggerated.